It’s a well known fact that South Americans, in particular Brazilians are crazy about their Football (or as we call it in Australia, Soccer). The Estadio do Maracana, or Maracana Stadium is Rio de Janeiro’s main football stadium and despite no longer being the largest in the world, is still the largest stadium in South America. Maracana was built for the 1950 FIFA World Cup in Brazil and has recently undergone massive renovations in order to get it ready for the 2014 FIFA World Cup and 2016 Summer Olympics. If you love football or just want to experience South American culture then don’t miss the chance to see a football match in Brazil. The experience is like no other, I can guarantee you that you will never forget it! Our hostel, The Mango Tree arranged a tour for us to Maracana Stadium from Ipanema Beach that included roundtrip hotel transfers and our tickets. It is definently possible to do it on the cheap and purchase your own tickets and use public transport, but as Rio was our first stop in South America and we were just getting our bearings we felt safer on an organised tour. Maracana is completely alcohol free, so before and after the game you will see locals and tourists alike drinking and spilling out onto the streets from nearby bars. Your visit to Rio would not be complete without attending a Brazilian football match at this magnificent open-air stadium. 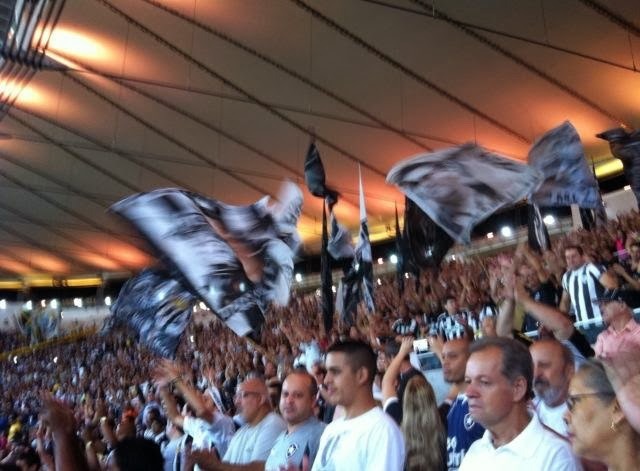 The stadium was not even close to being a quarter full when we experienced Flamengo and Botafogo playing a mid-season match. The atmosphere was absolutely electric and it was impossible not to be fully immersed in the Brazilian’s passionate and die-hard love of football with the drums, chanting, singing and enormous flags. I’m not going to lie – I spent half the time just watching the crowd rather than the actual game! It was insane! No one sat down the whole game and there was constant cheering, hugging even shirts coming off and being waved around by young, old, big and small alike! Have you experienced a South American Football game?